Hepatocellular carcinoma (HCC) is the third most common cause of cancer-related mortality and has highest incidence in Asia (including Far East / Middle East) and sub-Saharan Africa. , The prognosis is very poor without any specific treatment, and the median survival time in patients with early and advanced tumor is 6−9 months and 1−2 months, respectively. We report a rare presentation of HCC with mobile right atrial (RA) thrombus and pulmonary embolism (PE) along with disseminated tumor thrombosis at multiple sites. A 61 year-old-man with no significant past medical history was admitted in acute medical unit with one month history of exertional dyspnea, persistent dry cough, abdominal pain with distension, poor appetite, and weight loss. He was admitted in a regional hospital and was treated for chest infection. There was no history of fever, alcohol intake, or smoking. On the physical examination, the patient was icteric, not in distress with room air saturation of 93%, blood pressure of 132/76 mmHg, and heart rate of 94/bpm. Abdominal examination revealed tender hepatomegaly with the liver palpable 4 cm below the lower edge of the ribs with multiple 'wasam' marks on skin (hot iron branding marks). There was moderate ascites and mild pedal edema, but no signs of hepatic failure or cirrhosis stigmata. Chest examination elicited few scattered crepitations bilaterally. Laboratory results on admission were as follows: hemoglobin 12.4 g/dl (n = 14−18.1), hematocrit 40.9% (n = 35−53), leukocyte 14 × 10pwr9/L (n = 3.6−11.5), platelets 195 × 10pwr9/L (n = 150−450), erythrocyte sedimentation rate 35 mm/h, prothrombin time 12.2 sec (control 9.1−11.6), activated partial thromboplastin time 30.8 sec (n = 27.2−39.1), alkaline phosphatase 353 IU/L (n = 30−110), aspartate aminotransferase 281 IU/L (n = 10−45), alanine aminotransferase 91 IU/L (n = 10−40), gamma glutamyltranspeptidase 200 IU/L (n = 5−85), total bilirubin 47 μmol/L (n = 3−17), albumin 29 g/L (n = 35−50), and alpha-feto protein (AFP) 8.0 and 11 μg/L done twice (n = 0−15). Hepatitis B surface antigen was positive. Hepatitis C virus antibody and human immunodeficiency virus antibody were negative. Thrombophilia profile revealed normal antiphospholipid antibodies, lupus anticoagulant, factor V Leiden and prothrombin mutation, but low levels of protein C activity 39% (n = 65−130), protein S activity 51% (n = 60−130), antithrombin III assay 50% (n = 75−125). Abdominal ultrasound examination showed ascites, enlarged liver measuring 18 cm cranio-caudally with heterogenousechogenecity, and multiple hyper echoic nodules all over liver with the largest lesion measuring 6.6 × 2.9 cm [Figure 1]a along with thrombosis of the inferior vena cava (IVC) [[Figure 1]b, arrow heads] extending to RA. Chest radiograph and lower limb venous doppler were normal. Transthoracic echocardiogram was done to assess right atrial extension of the thrombus. Echocardiogram confirmed a large IVC thrombus entering RA [[Figure 2]a, arrow heads]. There was a large mobile lobulated, serpentine-like right atrial thrombus measuring 8 × 4 cm prolapsing from right atrium to right ventricle Figure 2]b and c, arrow heads, Video 1]. There was no significant gradient across the tricuspid valve and the right ventricular systolic pressure was 30 mmHg with good left and right ventricular systolic function. Computed tomography (CT) pulmonary angiogram revealed bilateral lobar and segmental/sub segmental pulmonary artery embolism [[Figure 3]a, arrow heads]with no lung metastasis. 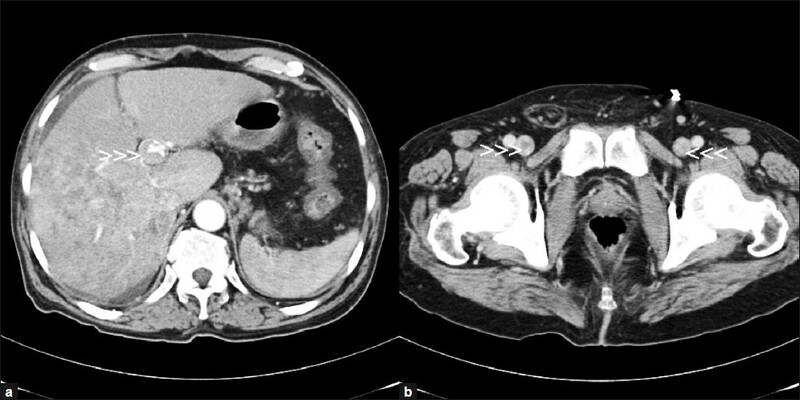 Triple phase abdominal CT demonstrated enlarged liver with multiple lesions, hepatic vein and IVC enhancing tumor thrombosis [[Figure 3]b, arrow heads] along with portal vein [[Figure 4]a, arrow heads] and bilateral femoral vein thrombosis [[Figure 4]b, arrowheads]. The lesions demonstrated typical arterial phase enhancement and venous/delayed phase washout diagnostic of HCC [The American Association for Study of Liver Diseases (AASLD) guidelines 2010]. In addition, there were multiple large paraaortic, aortocaval, and portocaval lymphadenopathy (1.2 cm). Kidney, gall bladder, pancreas, and spleen were normal. Since the disease was at a very advanced stage, a multidisciplinary team involving physicians, gastroenterologists, oncologists, cardiovascular surgeons advised conservative treatment. Patient was heparinised and was started on chronic warfarin therapy. A follow-up echocardiogram done 4-weeks later showed persistence of tumor thrombus in the IVC and RA [[Figure 5]a-b, arrow heads]. Patient expired after 12 weeks. The diagnosis of HCC is typically made by radiological liver imaging without need for biopsy, especially in patients with cirrhosis or chronic hepatitis B infection. , Revised AASLD guidelines for diagnosing HCC do not require elevation of alpha-feto protein > 200 ng/mL, as it is observed that there are significant false-positives (in cirrhotic patients) and false negatives. Underlying cirrhosis is the major etiology in more than 80%-90% of patients with HCC. , In those patients without underlying cirrhosis, hepatitis C infection, hepatitis B infection and heavy alcohol intake are involved in 3−54%, 4−29%, and 0−28%, respectively. This patient had underlying hepatitis B infection as the cause for HCC and he had all the typical radiological features of HCC, even though alpha-feto protein done twice did not show any elevation. Intra atrial thrombosis of HCC, if large and obstructive can present as right heart failure and is a potentially life threatening condition with high risk of death either due to acute PE or acute obstruction of the tricuspid valve or both. RA thrombi are commonly described in patients with atrial fibrillation/flutter, indwelling transvenous pacing leads or patients on prolonged central venous catheters. Primary thrombi develop within the RA (in situ thrombi) and are usually immobile attached to atrial wall. Secondary thrombi result from venous embolization, are mobile and temporarily lodged in the RA or right ventricle (emboli-in-transit). In the case presented, there was hepatic vein and PVT along with IVC and RA thrombosis but no tricuspid valve obstruction, and lobar and segmental/sub segmental pulmonary artery embolism indicating progressive showering of emboli from the RA thrombus. His clinical manifestations started with "respiratory" symptoms possibly due to peripheral pulmonary embolism, which was misinterpreted. The abdominal pain requiring multiple branding was ignored. This could have led to delay in the diagnosis in this patient. and serum AFP levels >1000 ng/mL had an 82% incidence of vascular invasion. In this patient, AFP was normal, but he had a 6.6 cm tumor detected in the right lobe which could be the cause for disseminated tumor thrombosis. In conclusion, this case illustrates a rare presentation of advanced HCC with mobile right atrial thrombosis along with disseminated tumor thrombosis at multiple sites. 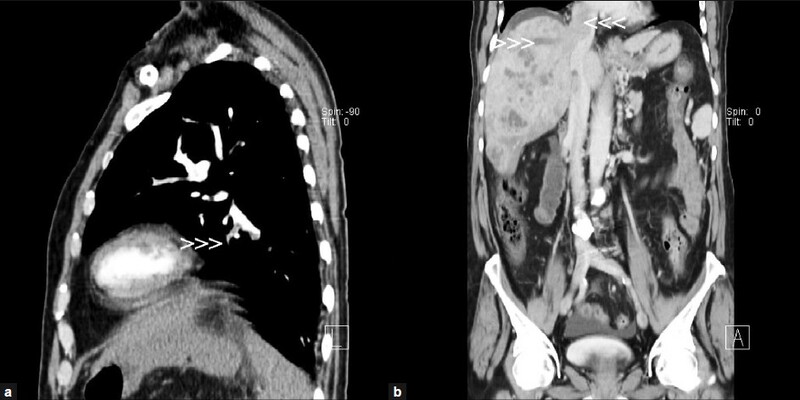 Furthermore, this case reiterates that an early detection and diagnosis may have increasing importance in the advent of new therapies for treating advanced HCC. 1. Bruix J, Sherman M; American association for the study of liver diseases. Management of hepatocellular carcinoma: An update. Hepatology 2011;53:1020-2. 2. Lau WY, Lai EC. Hepatocellular carcinoma: Current management and recent advances. HepatobiliaryPancreat Dis Int 2008;7:237-57. 3. Llovet JM, Bourroughs A, Bruix J. Hepatocellular carcinoma. Lancet 2003;363:1907-17. 4. Masci G, Magagnoli M, Grimaldi A, Covini G, Carnaghi C, Rimassa L, et al. Metastasis of hepatocellular carcinoma to the heart: A case report and review of the literature. Tumori 2004;90:345-7. 5. Connolly GC, Chen R, Hyrien O, Mantry P, Bozorgzadeh A, Abt P, et al. Incidence, risk factors and consequences of portal vein and systemic thromboses in hepatocellular carcinoma. Thromb Res 2008;122:299-306. 6. Kage M. Budd-Chiari syndrome and hepatocellular carcinoma. J Gastroenterol 2004;39:706-7. 7. Afonso DV, Laranjeira A, Galrinho A, Fragata J. Metastatic hepatocellular carcinoma: Right atrial tumor as primary clinical manifestation. Case report. Rev Port Cir Cardiotorac Vasc 2008;15:79-81. 8. Dedeilias P, Nenekidis I, Koukis I, Anagnostakou V, Paparizou N, Zombolos S, et al. Acute heart failure caused by a giant hepatocellular metastatic tumor of the right atrium. J Cardiothorac Surg 2011;6:102. 9. Sakata J, Shirai Y, Wakai T, Kaneko K, Nagahashi M, Hatakeyama K. Preoperative predictors of vascular invasion in hepatocellular carcinoma. Eur J Surg Oncol 2008;34:900-5. 10. Schwarz RE, Smith DD. Trends in local therapy for hepatocellular carcinoma and survival outcomes in the US population. Am J Surg 2008;195:829-36. 11. Kim SU, Kim YR, Kim do Y, Kim JK, Lee HW, Kim BK, et al. Clinical features and treatment outcome of advanced hepatocellular carcinoma with inferior vena caval invasion or atrial tumor thrombus. Korean J Hepatol 2007;13:387-95. 12. Inoue Y, Hayashi M, Katsumata T, Shibayama Y, Tanigawa N. Hepatocellular carcinoma with right atrial tumor thrombus: Report of a case. Surg Today 2011;41:1122-9.